BPI Sinag Challenge ~ Philippine Freebies, Promos, Contests and MORE! Are you an entrepreneur with a social mission? Or maybe you have a business idea that solves a problem. 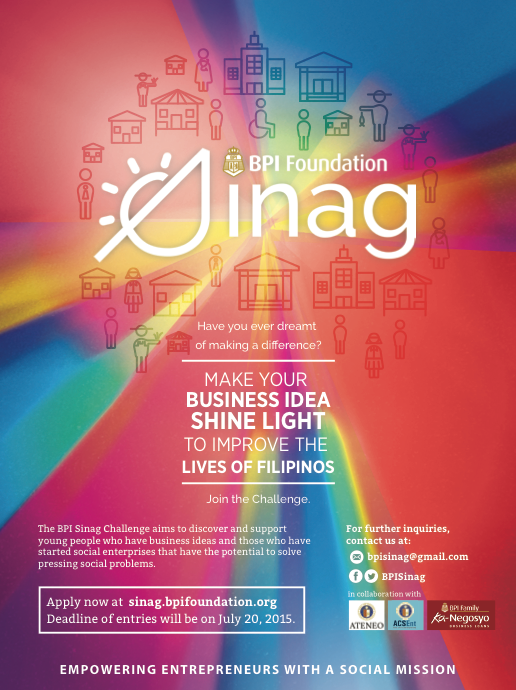 Then make it shine bright and help improve the lives of Filipinos in the BPI Foundation Sinag Challenge. The basic aim of this challenge is to discover, capacitate, recognize and support young social entrepreneurs who can help uplift Filipino communities. Apply now by downloading the application form online or by directly filling out an online application form available on the contest website. Around 20-30 participants will move on to the Semi-Finals round wherein they will be invited to attend a 6-day Business Bootcamp. From there, ten (10) will compete in the Final Round where they will make a pitch presentation, consisting of oral and PowerPoint presentations before the panel of judges and an audience. Five (5) winners will be rewarded with P200,000 cash + undergo a structured mentoring program over a period of 6 months + opportunity to set up an office at the Ateneo Impact Hub + an access to finance. From among these winners, one (1) will be named the Grand Winner and will receive additional cash prize worth P300,000. The 5 non-winners will not go home empty handed because they will receive P50,000 each. Send your application form to bpisinag@gmail.com with subject "BPISinagEntry_Lastname, Firstname, Middleinitial "